This past week has been totally horrendous! I seriously think that I must have broken a mirror at some point and not realised, because the amount of bad luck I’ve had has had me on a fine line between hysterical laughter and floods of tears. 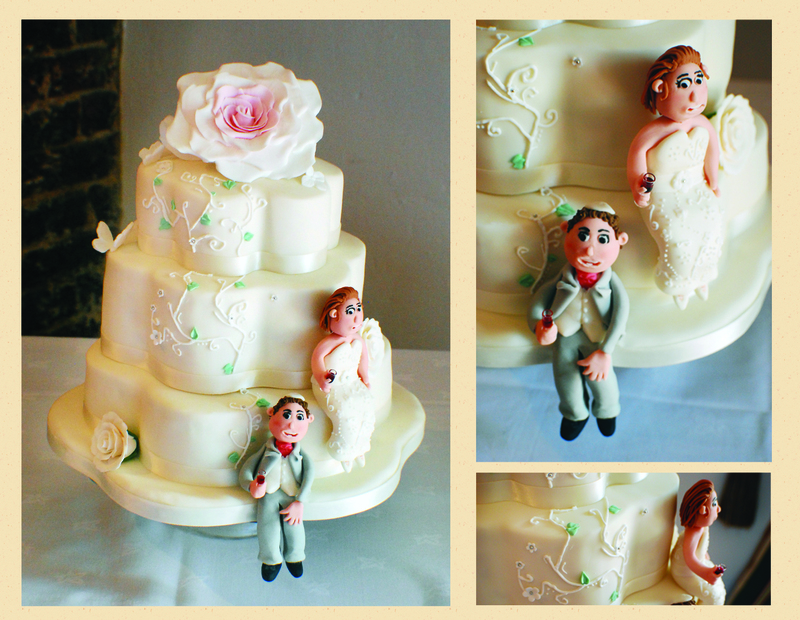 A little tightrope with cake at either side! I kept on laughing though…but it was tough. Let’s start from the beginning…. 1) I was working really hard last sunday on a display cake, and managed to pull a muscle in my back, that has been terribly painful since, and still is now. I know that makes me sound like such an old lady at the age of 22. In my prime I tell you! It is so bad at points that it simply hurts to breathe. I had to take two days off of work to lay in bed because of this, with the knowledge that I had two wedding cakes due yesterday and today. Eeeek! 2) An on-going medical condition decided to flare up mid-week, making me need to go to A&E at 8pm until 11pm. Luckily it wasn’t anything too bad, but gosh I was nervous it was! The waiting room tv adverts at the hospital kept me and Mr CC entertained. 3) Generally with the cakes I’ve just completed, the weather effected my icing and baking quite a lot. However, thank goodness, they came out beautifully in the end. Some of the best cake flavours so far (and a lot of ganache along the way!). Mmm ganache. I made myself my own mini pot of it to keep me happy haha. 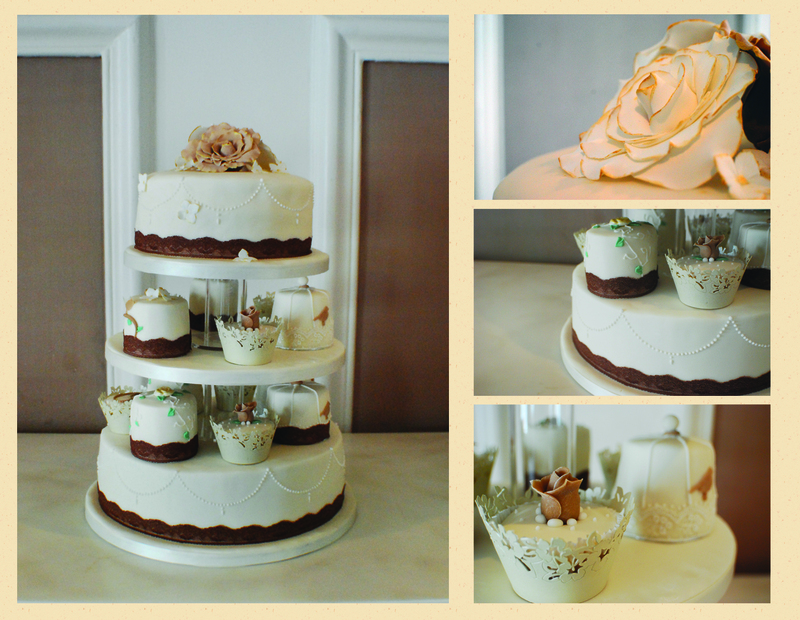 4) I get to the wedding venue yesterday to deliver the cake and its all ready…just putting the cake onto the stand…. *CRACK* yes. The cake stand snapped in half! I mean…how?! I’ve used it plenty of times before with it being absolutely fine, but today it just didn’t want to cooperate. I had to drive all the way back to the Chatter Box and back to the venue with a new one. Phew! …the battery was completely dead. So the bride was due to turn up within the next few minutes, and I was parked almost in the way with a car that was dead as a dodo. Helpfully, the local male shop owners stood by chuckling at me whilst I sat there quite shocked at this happening. Long story short…thank goodness for the AA. Even if I had to buy a new car battery, they saved my sanity today. Believe me, there were many more little things that went wrong, including the legs falling off of the modelled groom at one point, which was actually really quite funny. I got some lovely feedback from the wedding parties, so thats all that matters. I’ve got another cake due on wednesday, to an old school friend’s fiance, and a cake party on thursday. Busy busy bee. Then a week later is something I’ve been looking forward to for months….Belle’s vintage Wedding fair in Hove. Wonderful themes, creative wedding suppliers and a great atmosphere. Can’t wait! Great blog Chatter Cakes … and oh such beautiful cakes – you are one talented cake creator. I hope you’ve seen off the last of the bad luck now – you certainly deserve nothing but the good kind! Thank you Fran 🙂 heres hoping! !